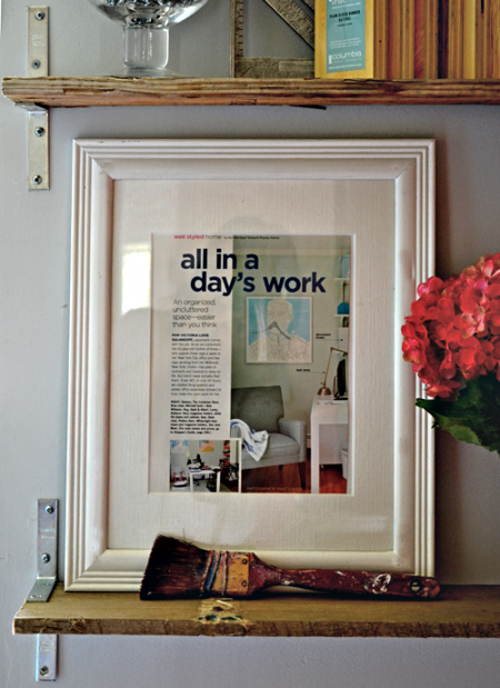 I've become obsessed with a new (to me) design show on DIY Network called A Bryk at a Time. Have you heard of it? It features Danielle Bryk, a stay-at-home mom who is going back into the interior design business after spending the last 15 years at home with her kids. It's super cute and feels more like a reality show then a design show as it features her kids, her actor husband Greg and other various family and friends. It reminds me of the Novogratz family but with less kids. I've been getting a bunch of ideas for my own house from things I've seen in the show. 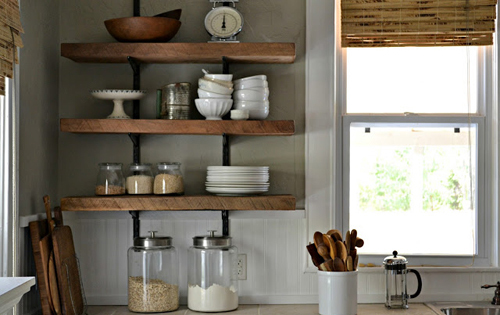 The one thing I'm obsessing over are these beautiful reclaimed wood shelves. I first spotted them in her kitchen, then I saw her make something similar for a client's bathroom. I've been looking for a shelving option for above our bar. If you can believe it, we still haven't unpacked everything from our renovation last year. This means that all of our bar ware is hanging out in boxes in our second bathroom when it should be hanging out on really beautiful reclaimed wood shelving, don't you think? This weekend we went to an architectural salvage store and picked up some old oak planks from a Kentucky horse farm and we plan to build some shelves soon. We're sort of stuck on brackets right now. 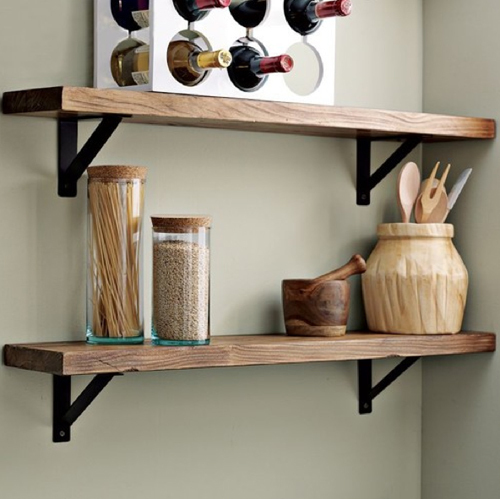 I really like the floating shelf look but that really limited us in terms of wood thickness. The hardware for a floating mount requires a certain thickness that we were having trouble finding when shopping for wood. I also believe that you are limited to how much weight a shelf can bear when it isn't supported by brackets. Not really an issue for glasses and bar ware but I didn't want it to be a concern down the road. I really love this option. It's more ornate than most but it adds some interest to the shelves and I think you can get away with something like this when you are using a really beautiful aged piece of wood because it draws attention to the shelf and also gives it a more modern feeling. I like these brackets for their simplicity. Their functional and don't draw a lot of attention to themselves allowing the shelving to really stand out. With our navy paint color, the brackets would probably blend right into the wall. 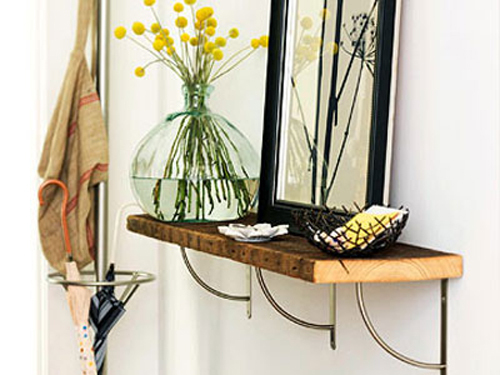 Here is the floating shelf option from Danielle Bryk's house. The picture really doesn't do it justice - it's absolutely beautiful. She has mounted some wine glass hanging racks to one side of the shelf which you can't see here. These brackets actually look like a very simple track system that you might find in a closet. 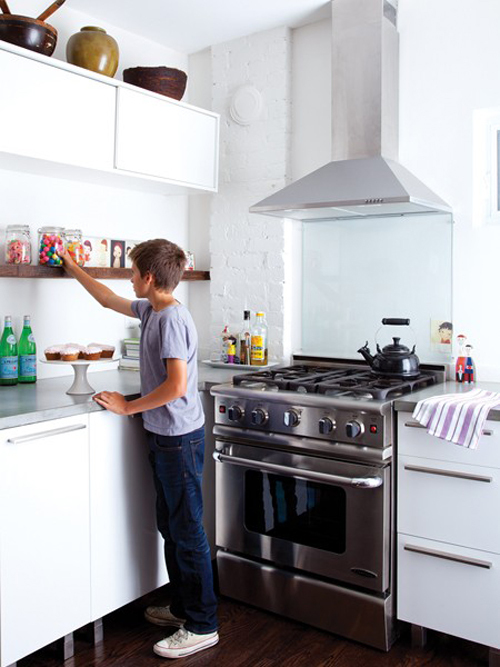 Not something I would ever gravitate towards for open shelving but I really like the way it looks here. I actually love this bracket but Mike isn't a fan. I think it gives the shelves a modern, industrial look. These are probably totally out of the running but I thought I would share it anyway, you know, for posterity's sake.